Discover all that Mai Chau has to offer with Mai Chau Lodge as a base. All hotel's guestrooms have all the conveniences expected in a hotel in its class to suit guests' utmost comforts. 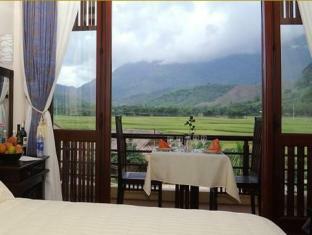 Each of The Mai Chau Lodge's guestrooms offers air conditioning, shower, desk. Hotel facilities offered at this Mai Chau accommodation include bar/pub, concierge, restaurant, laundry service/dry cleaning. Modern comfort and convenience are seamlessly combined to ensure the guests' satisfaction. These top-class facilities are complemented to excellent services to meet the needs of visitors to Mai Chau. To book a room at the Mai Chau Lodge, please select your dates of travel and complete fill out our secure online reservation form. Mai Chau Lodge location on Mai Chau map is not available.